Keep the holidays simple with an Easy Maple-Glazed Roasted Turkey Breast! You get the best tender, juicy white meat and a flavorful crispy skin -- all with about 15 minutes of prep! Roast the turkey breast for 2 – 2 ½ hours, or until an instant-read thermometer registers 165 degrees F. Baste with pan juices every 30 minutes. How long do you cook a roasted turkey breast? Roast this 7 lb. turkey breast in a 350-degree F oven for about 2 - 2 1/2 hours. 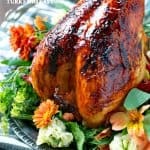 A good rule of thumb is to roast a bone-in turkey breast in a 350-degree F oven for 20 minutes per pound. For example, a 5 pound turkey breast will take just one hour and 40 minutes to cook. What temp should turkey breast be cooked to? You know that your turkey is done when an instant-read thermometer registers 165 degrees F when inserted into the thickest and meatiest areas of the breast. If the skin is getting too dark, cover the breast loosely with aluminum foil. When the turkey is done, cover with foil and allow it to rest at room temperature for 15 minutes. Slice and serve with the pan juices spooned over the turkey. If you're using a frozen turkey breast, make sure to give the meat plenty of time to thaw in the refrigerator. One (or even two) days will not be enough! If the skin is getting too dark while the turkey finishes cooking, cover the breast loosely with aluminum foil. Give the meat time to "rest" after you pull it out of the oven (before slicing). This will keep the meat nice and juicy! Don't wait until the holidays to enjoy this recipe. An oven roasted turkey breast makes a great Sunday supper -- and you can enjoy the leftovers in sandwiches all week long!